After an outbreak of epidemic plague in the Baltic Sea ports, the Stangate Creek area in the Medway Estuary in North Kent was designated a quarantine site for cargo ships destined for London in 1712. The quarantine of ships ended in 1896 but today evidence of the impact on the landscape can still be found. As far as we know, the area has never been documented despite its significant role in our maritime heritage. Much of Deadman’s Island is covered by the highest tides. Access is difficult and years of coastal erosion have washed away much of what remains of the area’s past. The area has also been designated a Site of Special Scientific Interest by Natural England and the RSPB have identified it as an important bird breeding and nesting site. A level of interpretation by a small team of professional creative artists collaborating with heritage workers is required to investigate and document the significance of the area. Since it unlikely the public will have any physical access at all to the island areas, now or in the future, we propose to employ a team of artists and heritage workers to produce a booklet, website, exhibition, school workshop programme, teaching resources and guided walks helping people to appreciate the area’s significance. Archivist and local history writer, Nicola Waddington will lead on the research and identify the cultural significance of the quarantine area. The information gathered will inform the significance of the cultural and physical aspects of the area’s heritage. The archival and interpretive materials will form the items for a temporary public exhibition on quarantine. We will organize boat tours sailing to the site to appreciate the heritage and celebrate the volunteers involvement in the project. We are therefore recruiting project volunteers to work and train with our archivist. For those interested in getting involved or finding out more about this project please email Trevor Mason at Dilute to Taste at: kentband@blueyonder.co.uk. We have also set up a Facebook page. Queenborough Harbour Trust is proud to say James Wharram will be coming to Queenborough on Friday 19/04/13 and will be giving a talk about the Lapita Voyage. 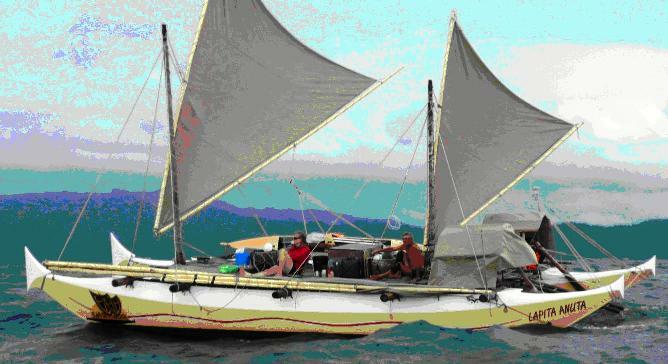 This voyage demonstrates that the Polynesians were capable of ocean travel using traditional designs. For a little information regarding James Wharram and the voyage please visit the web addresses below. James is stopping off at Queenborough on his way to London to pick up an award from the Ocean Cruising Club and offered to present this talk as he is a Patron of Queenborough Harbour Trust. If you are interested in building a boat, sailing a catamaran or sailing across oceans you will find James highly skilled and able to answer questions. Admission is £7.00 which is to cover the cost of the buffet. Could interested people please contact Eddie Johnson by e-mailing edcjohnson@aol.com or calling 07749375449. Theft of fuel has been an issue of late around the county. Please make sure that tanks and portable cans are secure. Three boats at Bow Bridge Marina were subject to criminal damage, windows were broken on the side adjacent to tow path. The one theft of note is the theft of a speed boat from a pontoon at Port Medway Marina Cuxton. It is a limited addition Cloud 9, four seater, described as white with blue side panels. It has recently been restored. We have requested a photograph.